Use your fingernail to gently turn over the outer edge so it has a little lip- do this for the whole snail shape. You can now ink the edges if you like. Starting at the end fold a small piece to your left as shown in the picture and start rolling it around tightly until you get to the end of the snail. If you get a long bit sticking out of the middle you can snip a little bit off with your scissors. 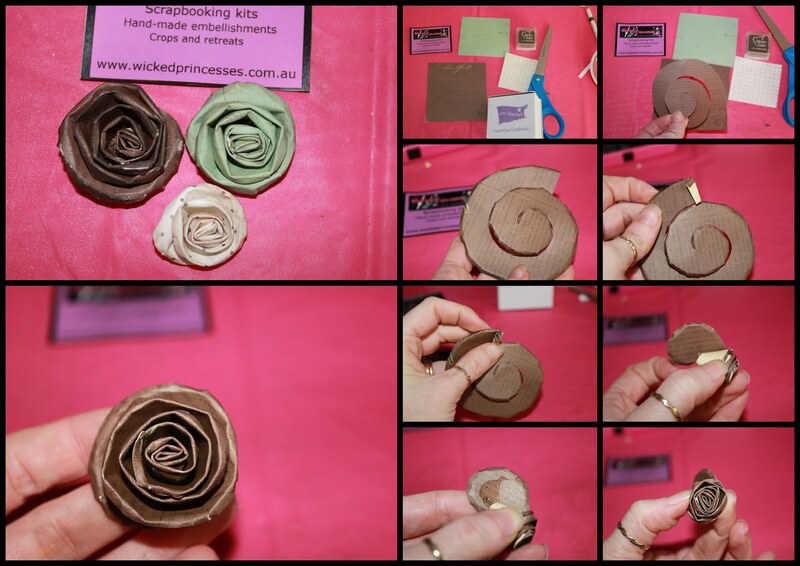 Hold the rose with your finger and thumb until it is firm enough to hold, then you can ink,paint or sand the edges. Who wants a tutorial on how I do my vintagey backgrounds? awesome thanks honey....have always wanted to give them a go but was unsure about it..now i will for sure! yes please on the vintagey tute!!! i'd love that!!!!! Thanks for the tute Krissy might have to give these a go, and would love to see your vintage los.. thanks for having me at crop the other night.. i enjoyed it!